Cool Winds is at the forefront of the premium plastic instrument revolution. Plastic brass hit the marketplace a few years back. 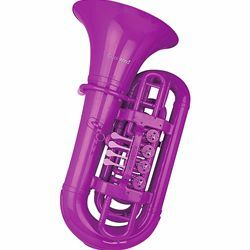 First came the 'bones and trumpets, and now manufacturers are applying what they've learned to these lightweight plastic euphoniums. Comes with large shank mouthpiece and soft gig bag.